In my last post I wrote about loving my first job as a cashier at Walgreens, and so many of you commented saying that you also enjoyed being a cashier. I wasn’t just as a cashier at Walgreens, I was a Beauty Advisor. Ohh la la, haha. Really, all it means to be a Beauty Advisor is that you work exclusively in the Cosmetics department and you make commission on the sale of certain beauty brands. ^ My favorite beauty team members during my senior year of high school… all holding up Loreal products because we made the most commission off of Loreal, haha! The three of us in that picture were a killer team and were consistently numbers 1, 2 and 3 in district commission sales! That was a serious point of pride for Andrea (the blonde) and I because we only worked part time and still sold the heck out of those cosmetics! Honestly, that job at Walgreens kept me sane during the three years that I lived in Inverness, FL. I moved there at 14 years old when my mom got re-married and I hated almost everything about that town. The biggest store is the Super Walmart, everyone drives a pick up truck and Future Farmer’s of America was the biggest club on my high school campus. There’s really nothing wrong with pick up trucks or farmers, but I was a Big City girl at heart and I couldn’t stand that the Event of the Year was the smelly, dirty fair. I hate fairs. I never really felt like I fit in with the Inverness crowd and I was so so so happy to move on and go away to college. Now, with my mom getting ready to move here to South Florida, I’m pretty excited to say goodbye to that town for good. I know a lot of people feel super nostalgic about their hometowns, but Inverness is not my home town… and even though I’ll likely never go back to my actual home town ever again, I don’t feel sad. I have never felt like I fit in better in any other city the way I feel here in Fort Lauderdale. Of course, it’s probably not the exact city that makes me happy here. It’s likely just because Adam and I have built our lives here, I’ve experienced professional success here, I found my passion for running here and … well, let’s be real, I do love living so close to a beautiful beach. Inverness is definitely the smallest town I’ve ever lived in, but my actual hometown really isn’t that much bigger or more advanced. Growing up I was the ONLY minority I knew. The private elementary school I went to didn’t have any African Americans, asians or hispanics… I was literally only exposed to upper middle class white people. That’s somewhat of a problem if you’re the one asian kid with no one around who looks like you – not even a family member because you’re adopted. I sadly and desperately just wanted to be white. I dreamed about having double eyelid surgery to get rid of my monolid so I could look more white. As I got older and moved to a public school I was around a more diverse group of people, but not by a lot because the cities I lived in were predominantly white. It wasn’t until I got to college that I finally had a close asian friend! Honestly, it wasn’t until college that I had a good friend that wasn’t white. Being surrounded by other minorities makes me happy. It makes me feel comfortable and normal. As a kid I always felt like I stuck out like a sore thumb. I was never comfortable in my own skin. By all conventional standards I had a happy childhood. I know some of you are probably rolling your eyes at poor me, the asian kid who went to a private school. Must have been real tough … of course it wasn’t difficult in comparison to other upbringings I could have had. That doesn’t mean it was easy. I know that just because my mom is moving here now and I’ll never have to go back to Inverness or my hometown doesn’t mean all that much for a childhood that is well over, but it means something to me. I feel like I’m breathing a sigh of relief to be closing the door on all of that. I don’t feel like my childhood represents anything about who I am today. And there are a handful of memories from my childhood that anyone would define as “awkward,” that I won’t share on this blog, that I’m happy to be burying for good. I won’t even get into the eating disorder stuff. I was having lunch with a co-worker yesterday and was blabbing on and on about how terrible Inverness was to live in. Honestly, I guess it’s not all that bad. I know a lot of people enjoy living there for a lot of reasons. It just wasn’t for me. I started peeling back the pages to the best chapter of my life when I moved to South Florida and each year has gotten progressively better. The only thing that has been missing is my family. I haven’t lived closed to my parents since I moved away for college almost 11 years ago. It’ll be really nice to have my mom here soon, and my dad here before the end of the year (fingers crossed). I have never in my life been happier than I am right now. I’ve got Adam, I’ve got Cecil and soon my mom and dad – along with a great job, opportunity to travel often and the ability to feel (mostly) comfortable in my own skin. Life IS good. Thanks for letting us get to know you better through that post, Kristina. I bet your parents are happy to be moving closer to you too! My family moved when I was 12 to a tiny little town (according to wikipedia, population wise, it is about 1/5 the size of Inverness. Seriously small town. Too small to even have a walmart.) and, like you, there are very few things about that town that I liked. My parents have since moved away, but I still have a grandfather that lives there. I know there will be a similar sense of relief when that chapter of my life closes for good. I also never considered this to be my hometown. It was actually a bit of a relief just now to do the math and realize that I lived their for only 6 years, but I have lived in my current city for 9 years (officially the longest I have ever lived in one town!). I loved getting to know you a little more through this post. Life is definitely good, and I love when people recognize and celebrate that. I don’t really have strong feelings one way or the other about my hometown, but I do still love & have many wonderful memories of the house and surrounding woods where I grew up and where my mom still lives. I don’t think I could live somewhere like that now, though, because I’m too much of a city girl at this point in my life. You feel about Inverness like I feel about Baltimore. I hated it, and I do not like going back there much at all. I only go to see my father-in-law. Mostly that place has bad memories attached to it for me. It’s a process of growing to feel good in your own skin. I always envy super confident folks who don’t even know how that feels. You are beautiful, BTW Cheers. Great post, Kristina! I really enjoyed reading it and getting a glimpse into the wonderfulness that is you. I’m so glad you’ve found your happy place! I’m so glad to hear you have found your happy place. I didn’t have a tough upbringing by any means but I hated where I was from. I knew in my heart that I didn’t belong in Ohio. The second I moved to Wilmington I knew I belonged and I never want to leave! Peace is such a great feeling. I’ve recently found that when we started getting involved at the church. Everything has more meaning these days. Great post, very happy you will have your family shortly. I loved learning more about you through this post, Kristina. It seems like you faced a lot of adversity growing up and it made you a better person and who you are today. I grew up in a place where there were very few minorities, which is one of the reasons I chose to go to grad school in Houston → I needed to surround myself with diversity and learn more about different types of people. I’m glad that you are at a place in life where you feel fulfilled and happy. Some people don’t ever find that content state of mind. I am so happy life is good for you right now. 🙂 I know it sounds silly because we only know each other through blogging, but I feel like I know you and if we lived closer we’d be friends in real life! I was not rolling my eyes at your story. I mean, we all feel different from others in our own way, but if your difference is literally how you look, it is not something you can hide like other differences some of us have. Thanks for sharing your story! It sounds like you’ve had incredible opportunities to grow and experience life beyond your hometown! I moved out of state for college and NEVER thought I’d live in my hometown again (Minneapolis). Well, almost 10 years later, can you guess where I am?! 😉 I was able to live in many parts of the country and grow up on my own, and I’m sure I’d be in a very different place if I just stayed here for college and never lived elsewhere. PS – you totally rocked the Walgreen’s smock! I loved the commission on beauty products – I didn’t work too hard to sell them, but customers always seemed to buy them, giving me a little bonus! I’m glad that you are happy with life. You are beautiful and it’s sad that you were in a situation that made you want to be anything other than yourself. I understand the sentiment about a small town…. I’m currently living in one and it’s just as you described. Glad there is so much happiness in your life and so happy that your mom is moving closer to you (as you know I love hanging out with my mom haha). 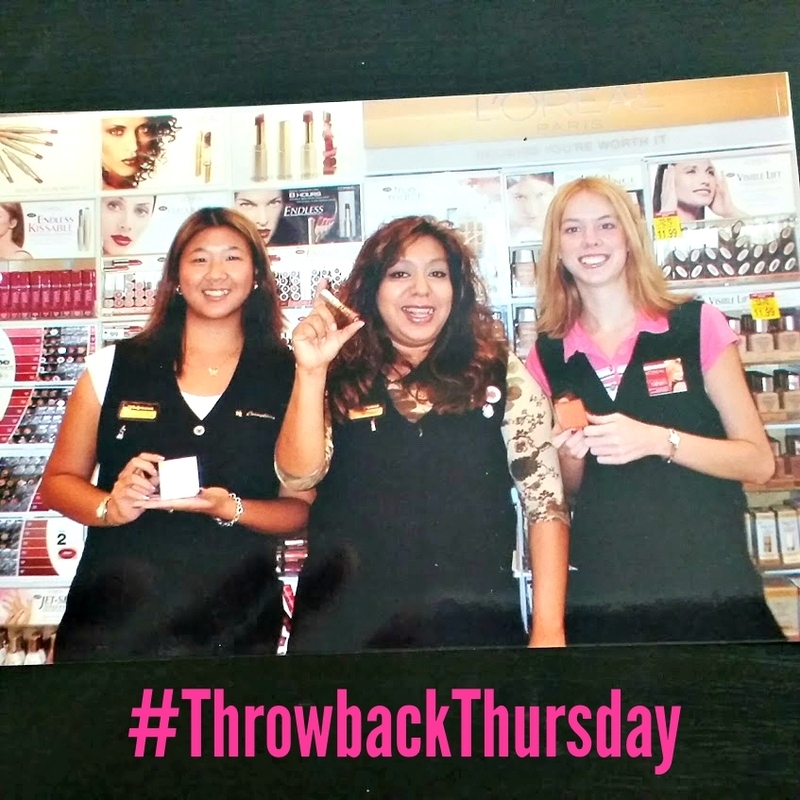 Thanks for sharing the TBT picture! I am not surprised you were great and what you did!